I mean, good people of ProJo, thanks for reading the column (you have to learn good journalism somewhere, I suppose), but you didn’t have to build an AltFacts shrine in the shape of a brand-new gun store as well. Not that I don’t appreciate it; it is very kind of you to affront your 70,000 readers with such monumental thoughtlessness (on the very same day your headline was about the Tree of Life shooting), but maybe there is a more effective way of achieving the same goal? 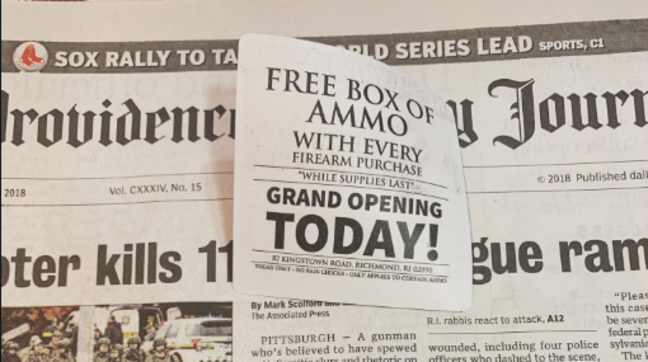 Gun demonstrations at a daycare (with free copies of the paper), for example. Start them young. They’re easier to manipulate that way. Just ask the priesthood! The United States no longer wants to be great. In a disappointing show by the American people, the nation elected a slew of minorities to positions of power for which none of them are adequately qualified. More women will serve in Congress than ever before, with 118 seats set to be cheapened by endless complaining and monthly blood loss from a hoard of hyped-up broads. Worse, two of the dames are from Red Indian tribes, which goes to show Manifest Destiny didn’t do a good enough job when it had the chance. Worse still, a further two of them are Arabs; a pair of ham-fisted Muslims with names I can’t even pronounce (Rashida Tlaib and Ilhan Omar). But there’s more! Rumor has it that some 17 of the 87,000,000 ISIS members in the immigrant caravan marauding toward the southwest border have been elected to local council positions in Nevada’s 36th District. However, Fox News has managed to confirm that Satan himself entered into an agreement with Hilary’s emails (yep, some of you are still chirping on about this) in order to secure the governorship of Colorado for that gay guy who won it. And speaking of gay guys, one of those Indians is a gay woman! A gay Indian?! Who ever heard of a gay Indian?! This is the end of freedom y’all … if you need me, I’ll be in rural Idaho with a box of ammo and 30 gallons of Bud Light (FTS). Shout-out to my man, Republican hero Michael Kalny of Shawnee, Kansas, who said the Indian women “would be sent back to the reservation.” You defend that flag, brother!